Impetigo is a condition that is characterized by red sores anywhere on the body. These sores usually appear on the face and areas surrounding the mouth and nose and on feet and hands. The red sores tend to crack and excrete fluid leaving visible outer coating. Impetigo is a transmissible bacterial skin infection and is actually a condition that is common in children. Adults can also suffer from it but the chance is very minimal. There are two kinds of bacteria-strep that can lead to the formation of Impetigo. These are streptococcus and staphylococcus. When a child acquires skin conditions such as insect bites, burns or cuts, poison ivy or eczema, these bacteria find a way to enter the body. Studies also show that after having a cold or any kind of allergy, the streptococcus or staphylococcus attacks taking advantage of the child’s weakened immune system. Although these are the most common causes of impetigo in babies, parents must be aware that children with healthy skin or entirely healthy body can also acquire this disease. Coming into contact with someone who has impetigo also makes a child infected. Sharing of clothes, bed sheets, towels, or even touching a toy which has been touched by someone with impetigo makes a child susceptible to this skin condition. There are some factors that heighten a child’s affliction to acquiring impetigo. The first one is the age which says that kids ages 2 to 5 years old have less immunity to impetigo. Another risk factor is the condition of the area where the child is usually at. The child is more at risk if he stays in a place where there are a lot of kids like in schools, play houses and child care centers. The humid weather also plays a role in the conception of impetigo, as well as some sports where skin-to-skin contact is unavoidable. Apart from the evident impetigo symptom which is the occurrence of red sores, large blisters may also emerge. These usually come out on the infant’s trunk. Those who are badly infected may experience painful sores filled with fluid that can turn into ulcers. What to Do When These Symptoms Transpire? If parents suspect that their child may have impetigo, it is best to immediately consult a doctor. The doctor will carefully assess the condition of the child’s skin. The medical practitioner may remove a piece of the child’s sore for further examination and to determine the kind of bacteria that the child has acquired. Urine and blood tests might be required. Performing home remedies immediately after noticing a few red sores on the child’s skin is fine. Parents may apply over-the-counter antibiotic ointment on the sores. The sore should be covered with anon-stick bandage to prevent spreading. With persistent symptoms, consulting with the doctor is advised. An impetigo baby has to be given proper treatment the soonest possible time. 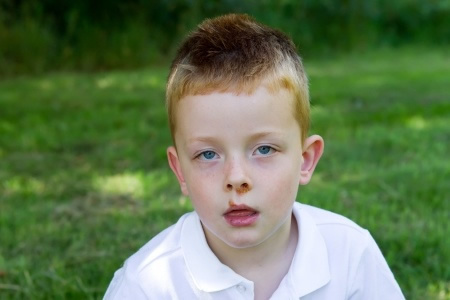 This is for the reason that impetigo can lead to complications although this rarely happens. Serious impetigo can lead to kidney problems and cellulitis. Oral antibiotics will be prescribed but if the case is mild, the doctor may settle on antibiotic ointment for the sores. Impetigo usually gets cured in a week with proper treatment. To prevent impetigo, the child’s skin must be kept clean at all times. It is advised to wash cuts, scrapes or any other kind of wounds immediately. If infected with impetigo, the child has to wash his hands thoroughly. When applying topical medicine on his sores, the parents must wear gloves. The child with impetigo should stay at home until the doctor says his condition is no longer contagious.